The point was made when I googled my new employer. “Did you mean Canada?” it helpfully asked, showing me a page of search results about a North American country, festooned with red maple leaves. CAADA – Co-ordinated Action Against Domestic Abuse – needed a new name, and fast. Founded in 2005, CAADA is a relatively new player in the domestic abuse world. We were born out of an urgent need to find better ways to help victims of domestic abuse. The interventions we pioneered now help more than 75,000 victims every year. Our approach works: more than 60% of victims who get help from a specialist Idva (independent domestic violence advisor) working with a Marac tell us that the abuse stops (a multi-agency risk assessment conference, or Marac, is a local, victim-focused meeting where information is shared on the highest risk cases of domestic violence and abuse between different statutory and voluntary sector agencies). In our sector, CAADA was seen as expert and innovative. But we were unknown to wider audiences, focused as we were on winning practical change in service delivery. Our name was hard to say, spell and search for (as I discovered!). Our brand lacked warmth and humanity – we spoke like a quango, rather than a charity with a vision for a world without domestic abuse. And all of this this undermined our capacity to make the changes we need. As we sat down to plan our strategy for our second decade, working with the whole family, we knew we needed a better brand if we were to reach beyond people who knew us well. We chose SafeLives. It reflects our relentless focus on one goal: family safety from domestic abuse. And we jettisoned CAADA’s dry, technocratic style in favour of colour, movement and images of families living their lives in happiness and safety. But a charity rebranding isn’t news – and we knew we wanted to create more of a splash to mark our change of strategy. CAADA’s focus on evidence gave SafeLives a huge asset: the largest database in the country of domestic abuse cases. And I knew there would be a story to tell in all that data. The right stat could be a gateway to help people find out about SafeLives and what needs to change. It’s rare to get a new angle on domestic abuse. After all, in our sector a zombie stat that’s three decades old is still regularly used to talk about how long domestic abuse goes on before victims get help. After a lot of data wrangling, we found it. More than 85% of victims are in contact with professionals – on average five times – in the year before they get effective help. 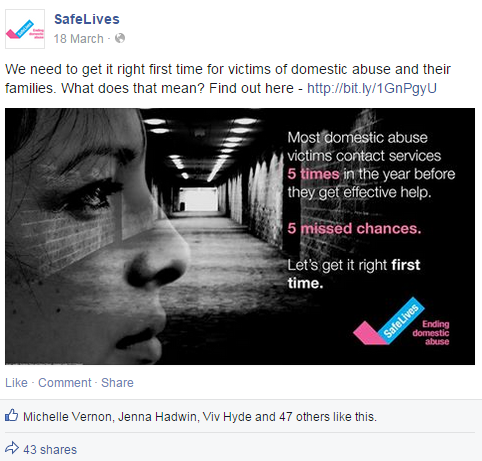 Or, as our headline put it: “Professionals miss five opportunities to stop domestic violence, says SafeLives”. A priority of our new strategy is to identify every family where there is domestic abuse far earlier. Straightaway we saw that together our new strategy and the headline stat formed a campaign for change. We called it 'Getting it right first time'. Creating the campaign from then on just flowed. We wrote a report to illustrate why professionals don’t spot domestic abuse, and recommended changes. We wrote top tips for those on the frontline who wanted to know how to spot domestic abuse – and what to do to help victims. Every victim of domestic abuse has a story about how someone missed an opportunity to help them. So when we asked, several brave and brilliant women stepped up to tell their stories and call for change on national TV and radio. We ran the theme across our social media, through a short animation, through all our PR and used it as the title of our annual conference, which ran on the day of relaunch. We illustrated it all with victims’ own testimonies, and challenged every professional to do better. We got more than 75 pieces of coverage, including a nine minute package on Channel 4 News featuring Rebecca, who had survived domestic abuse, and live questions to the education secretary. Other highlights were Good Morning Britain, Sky News, BBC 5Live and big pieces in the Guardian, Telegraph, Times and Cosmopolitan. Both the home secretary and shadow home secretary welcomed our campaign, and all day we were part of the biggest conversation we’ve ever had on social media. SafeLives was beginning to cut through to new audiences. Since the launch, our web visitors have more than quadrupled. In recent qualitative research amongst our audiences, the new attributes of our brand were being reflected back to us already, just months afterwards. We used the 'Getting it right first time' campaign to start a conversation about how we find every family living with abuse far more quickly, and get them the right help that stops the abuse. We also used it to introduce new audiences to what SafeLives does. Around the country, our team is helping more local areas put our ideas into practice. And all of that puts us in a better position to achieve our goal: we won’t stop until every family is safe.